In a certain winter camp there lived an old man and his three daughters. He was very poor and there were many holes in his tent, and he had hardly any warm clothes to wear. The winter was cold, frosts were bitter, and members of the family were freezing. One day at the height of winter a terrible blizzard started. The wind blew a whole day, then another day and another, it blew so hard that the old man thought his tent of hide would be swept away into the taiga. All the people who lived in that camp were stranded in their tents, unable to go out to seek food. "We won't be able to live through this blizzard," the old man said. "It is Kotura, the master of the winds, who has sent it down on us. Evidently he is displeased with us... Now, my eldest daughter, you must go to Kotura and plead with him to stop this blizzard," "But where do I go!'" his eldest daughter asked. "I don't know the way." "I will tell you what to do and where to go, but you must do exactly as I say. I'll give you a small sledge and you will push it against the wind and then follow it. But mind you do not stop on the way, not even to shake the snow out of your boots, not even to adjust your clothes when the wind rips them open. You will come to a high hill; go up it. A little bird will come flying to you and perch on your shoulder. Mind you don't shoo it away; stroke its feathers and treat it well. And when you reach Kotura's tent, don't touch anything. Sit down and wait. When the master of the winds comes, do as he tells you." "How One Girl Saved Her People"
The eldest daughter put on her fur clothes, pushed the sledge into the wind and it started easily. She followed the sledge tor only a short while before the fastening of her clothes worked loose and she telt the cold. She disobeyed her father's council and stopped to adjust her clothes and to shake the snow out of her boots. Then she went on her way against the wind and blizzard. She walked for a long time before she saw the hill. She climbed it, and sure enough, a small bird flew to her ready to perch on her shoulder, but the girl waved her arms in anger, shooing the little bird away. Soon after, the girl descended the hill and reached Kotura's tent. She entered it and saw a big piece of roast venison. She started a fire going, got warm. and set to work on the venison, picking the choicest, richest morsels. Suddenly she heard someone approaching the tent The hide over the entrance was lifted and a young, broad-shouldeied, handsome man entered. It was Kotura He looked at the girl and said: "You are welcome to my house. Live here as long as you wish, but on one condition: that you help me a little with domestic duties. I am back from hunting and here is some meat, now you cook it." The girl cooked the meat. Kotura told her to take the meat out of the pot and divide it into two equal portions. "One half we will share between us, and the other half you must take in a pot to the next tent where an old woman lives. Give her the meat and wait until she brings the pot out to you." The girl took the meat and went out of the tent. The blizzard was howling, and the snow was falling so thickly that she could not see anything. So the girl just took a few steps, threw the meat into the snow, and returned carrying the empty pot. Kotura looked at her but did not say a word. Then Kotura again went out into the taiga, setting the old man's daughter the task of making him a suit of clothes from the skins he had. The girl had barciy started when the hide by the doorway was lifted and an old, gray-haired woman entered the tent. "My dear daughter," she said, "I have got a speck in my eye, please take it out." "Don't bother me, I am busy," the girl answered crossly. Can't you see for yourself?" The old woman turned away and left without saying another word. When Kotura returned from his hunting expedition that evening he asked: "Have you made my clothes?" Kotura took them and felt at once that the skins were hard because they were badly dressed and the clothes, badly cut and sewn, did not fit him. Kotura grew angry, and drove the old mans daughter out of the tent. Meanwhile the blizzard became fiercer still, howling like a lost soul. The people everywhere trembled in their homes. They could not go hunting, because all the animals hid from the blizzard, and there was nothing to be seen but a white murk. Children cried with hunger and their mothers had nothing to give them. "I see that my eldest daughter has disobeyed me," the old man said sadly. "She did not do as I bade her that is why Kotura is so angry with us now. You must go to him, my middle-daughter." 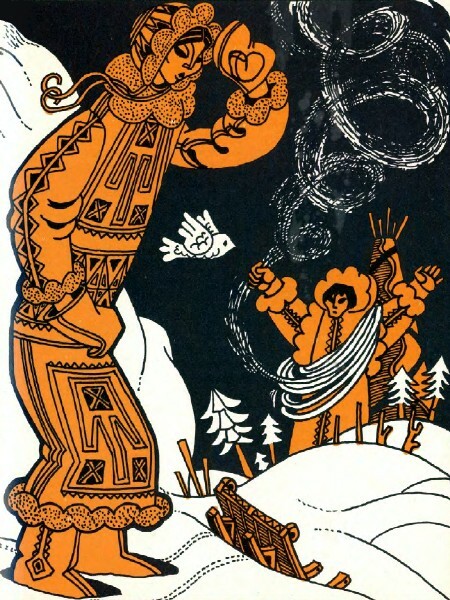 But his second daughter, too, disobeyed her father and Kotura drove her out of his tent. The old man sat in the tent with his youngest daughter, waiting for a clear day to dawn. But the blizzard raged and howled, blowing down people's dwellings, leaving them without shelter. "It is your turn now, my beloved youngest daughter," the old man said with a sigh. "I hate parting with you, but if I don't all our people will perish from hunger." The girl went out and followed the little sledge through the blizzard. She walked on blindly: the whirling snow obliterated everything, the furious wind tore at her clothes, the snow got into her shoes, but she went on doggedly, ignoring the cold and the blizzard. She did exactly as her father had commanded. As she went up the hill a little bird came flying to her. The girl did not shoo it away as her sisters had done. She stroked its feathers and caressed it. Then she jumped into the sledge and drove downhill straight to Ko tura's tent. When Kotura saw the girl, he laughed with pleasure, and asked her: "What have you come to me for?" "To beg you to stop the blizzard. Otherwise the people in our winter camp will perish!" "Then don't stand by the door, come in. Come in, start a fire and cook the meat. I am hungry, and I expect you are hungry too after your travelling." The girl picked up the pot, cleaned it well, and quickly cooked the meat. After the meal Kotura asked the girl to take the rest of the meat to the tent next door. * The Evenks live over a considerable part of Siberia (between the Taimyr Peninsula and Yakutia). The region is known as the Evenk National Region. Their main occupation is hunting, trapping and reindeer breeding. The traditional Evenk dwelling is a conical tent of hide supported on 20 to 25 poles. The traditional clolhing is made of skins and fur. Shamanism was the religion of the Evenks and these hunting people used to worship animals, "the masters of nature". In Soviet times these nomadic reindeer-breeding people have become settled: villages and even townships appeared and their children started attending school and often went on to institutes of higher learning. An alphabet was evolved, and literature thus appeared. The former reindeer breeders and the Evenks became scientists engineers, artists, actors, meteorologists and poets. The girl picked up the pot meat and went out. She did not know which way to go or where to find the tent. She stood, pondering, and then started off at random, determined to do as Kotura wished. Suddenly a little bird appeared from nowhere, the very same bird that she had seen up on top of the hill. It wheeled and hovered overhead, bidding the girl to follow it, which she did. Then she saw smoke rising from the snow. She came closer, stirred the snow with her foot and saw a door. An old gray-haired woman looked out and asked: "Who are you? What did you come for?" "I have brought you some meat. Granny." "Thank you, thank you, my dear girl. Give it to me. But you stay here." The girl waited and waited outside for a long time, until she was almost frozen. At long last the entrance hide was lifted again. The old woman looked out and handed back her pot. The girl saw that there was something in it. She returned to Kotura's tent and looked at the old woman's presents. There were knives, scrapers, and other things used for dressing skins, and in addition some steel needles. Kotura laughed, saying: "I see you have many useful things! Make me some new clothes while I go out hunting." The girl set to work, but what could be done in a single day? Suddenly an old grey-haired woman entered the tent, the very same woman to whom the girl had taken the meat. Now the old woman said: "Help me. There is a speck in my eye, please take it out." The girl immediately put down her work and took the speck out of the old woman's eye. "That's better, now my eye doesn't hurt any longer," the old woman said. "You've helped me and I'll help you." She left the tent but soon returned with four girls. "These will be your helpers and the live of you will make everything in good time." The five girls together set to work dressing the skins, cutting them and sewing. They did not notice when daylight became dusk. Kotura returned from his hunting and when he saw his new clothes he wanted to try them on. But first he picked them up and examined them. The skins were soft and pliable. He put them on and they were neither tight nor loose; they fitted him well, and the stitching was beautiful. Kotura smiled with pleasure and said: "You are to my liking, my fair maiden. You have a heart of gold and hard working, clever hands. You are also brave: you were not afraid of the terrible blizzard because you wanted to save your people. You'll make a good wife - marry me. My mother likes you and so do my sisters. Stay in my tent for the rest of your life!" As soon as he said these words the blizzard died down. The people were no longer freezing, they came out from their tents. Men went hunting, women set to work on home chores, and children started their games in high spirits.